This series of twelve dances is the natural continuation of the educational project steering wheel guitar vol. 1 and 2, which a few years ago is emerging in the landscape of learning basic guitar. 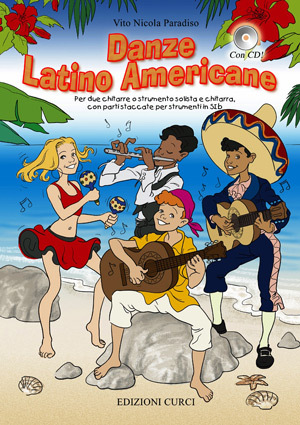 These are original compositions written in different styles of Latin American music, specifically designed to stimulate and increase in young performers, the interpretive research, not even in the resolutions of simple rhythmic sequences, typical of these genres. Each dance is in fact a tribute to the style of the traditional genres or composers who have particularly characterized the history of this music and danced all over the known world: Heitor Villa-Lobos, Ariel Ramirez, Piazzolla, Gardel, Jobim, Toquino, Cugat , Bonfà, etc.. Each of them has inspired, with its sounds and rhythmic peculiarities, the songs presented here. Written for two guitars, these dances can also be performed with instruments in C or B flat and guitar thanks to the specially transcribed parts, placed at the end of the volume. You can then replace the first guitar with violin, flute, saxophone, trumpet or percussion instruments are determined as the vibraphone or marimba, the latter particularly suitable, because of the typical areas in the Caribbean. All songs are accessible to a third instrumental course, both for the parties and for the melodic accompaniment. The minus-one CD attached, also, offers not only the opportunity to listen to the songs, but also to exclude (turning the knob to the left or right "balance" of the stereo) one of the two guitars in this way it will be possible to perform liking the melody or accompaniment, along with one of the two guitars recorded on the CD.